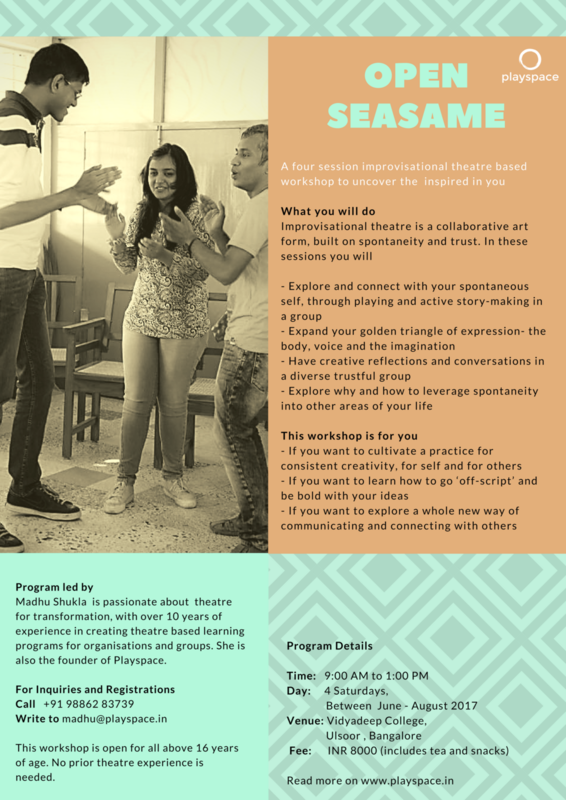 Very excited to offer a new workshop, that invites anyone to relish their playful side- over four sessions of four hours. This is personally exciting for me as there is so much power in a group process. Committing to meet consistently over a period of time allows one to experience oneself more mindfully, have the group serve as a mirror to one's personal patterns, build a sense of belonging and progressively build new habits or practises. More importantly it becomes a shared experience of a creative journey, both individual and collective. I myself have been a part of a psychodrama group(of course a different energy from improv) for over two years now. I find it to be an incredible gift to have such a special intimate relationship with a group of people who are my friends, confidants, fellow travellers and wisdom holders. I find it a grounding experience meeting the same group again through the different phases of my life and see an increase in my levels of self awareness about my thinking and behaving patterns. Also something about sharing in a group or even witnessing others share- helps me gain perspective about my own struggles, healing and growth. So in offering Open Seasame I hope to create a space for people to come together and playfully grow together.